We want to take you on an adventure through paradise. Come join the crew onboard the "Tiki XIV" for a trip to some of the best surfing and diving spots in the Virgin and surrounding Caribbean Islands. We will take you to tropical remote locations which few ever journey to. Weather you want to surf the pristine beaches, once explored by the likes of Columbus, Sir Francis Drake and the infamous Blackbeard, dive the ships they sank in battle or enjoy the local rum punch as the sun sets over the horizon, the Tiki XIV is equipped to do it all. We are a relaxed family run business and want to give you memories that will last a lifetime. We're ready to take you on a Tiki Adventure. Richard & Edith, Deb & John, Susan & Ron, Linda & Jack Having waited two years for the ultimate vacation, my brother Richard, his wife Edith, and six of their close friends hopped onboard the Tiki XIV. After checking in to Customs at Sopers Hole, Tortolla, and some of the best little souvenir and gift ships on the Island, we tied off the dinghy and cruised over to Norman Island for our first dive. This has become one of our favorite dive spots. It's beautiful and exciting, full of sea life and an easy dive to break everyone in from the long, not so cold winter. The first thing Ceil and JD wanted to do when they arrived was to get in the warm tropical water. Teaching them the resort dive was an easy task, they took to diving like a fish in water. 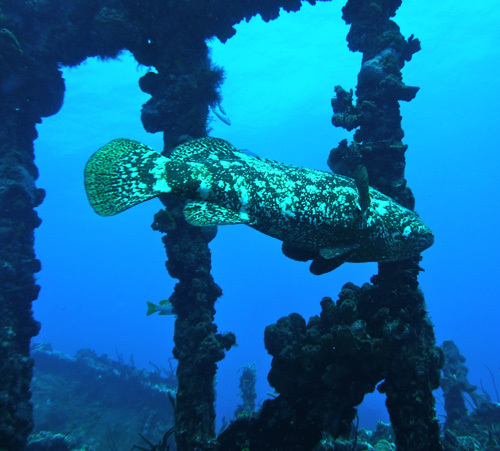 The Tiki then took off for the BVI's and a familiar reef that would excite any new or advanced diver. This time we were in luck, four friendly tarpon that we had seen on the previous charter, came back for a visit. Lillians reef goes from 15ft. to a 55ft. ledge if you choose. Tropical fish surrounded us everywhere along with dozens of species of soft and hard corals in a multitude of colors. At night the cove at Soldier Bay was calm and peaceful and the sky was filled with an infinite amount of stars. This charter was five young surfers on a mission. The first stop was Apple Bay, Tortolla on a North, North East swell. After a morning session to get things rolling the Tiki pulled anchor and moved on to a better location for the swell direction. The next four days were calm anchorages at night and days full of non stop surfing. It was great to see the surfing abilities of these East Coast surfers. PS: Perry, keep charging. Mike, Clay, Cole and Pat Sones Family Christmas Surf Vacation The ultimate Christmas present to the Sones boys, Clay and Cole, was a surf trip to the Caribbean onboard the Tiki. The trip started out with solid head high surf and consistently stayed in the head high to well over-head rang for the rest of the charter. The swell peaked at Cane Garden Bay offering up to double overhead reeling rights with rides up to 300 yards or more. We surfed 6 waves in four days, which 3 out of the six waves were even new to the Tiki Crew! This just shows how wave rich the Caribbean can be if you know were to go and when to go. When the Petersons decided to take their whole family on a Caribbean vacation, they went on line and discovered Tiki Adventures. Upon landing in St. Thomas and hopping onboard our Carolina skiff, they instantly knew they were in for something different. This was a return trip for Amy & Pierre but this time they decided to bring their three children for a family vacation. 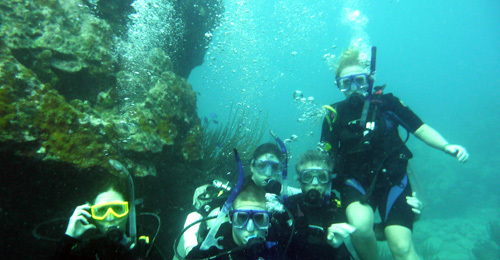 While on board we had our friend, Bethany, a certified Dive Instructor in St. Thomas, certify Brooke, Dijana and Sava. After the course was finished we took them for their first lobster dive and made them catch their own dinner. 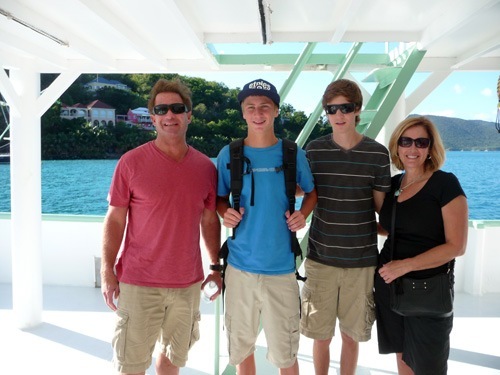 We then left St. Thomas for the British Virgin Islands for more diving adventures. This was by far a chance of a lifetime for their family to do this together. 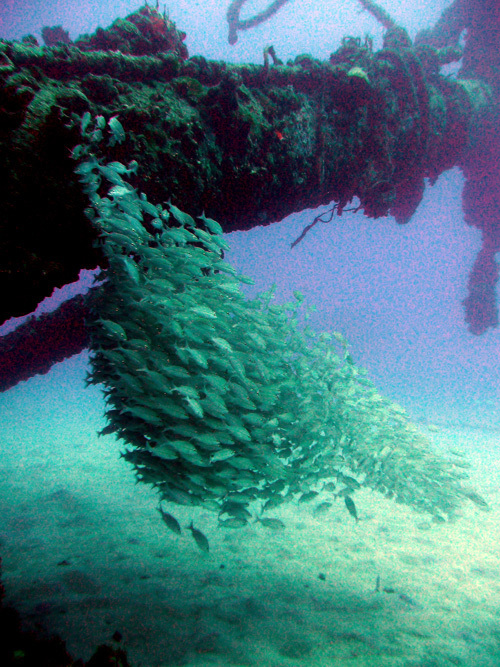 Having spent four seasons in the Caribbean, we are still constantly finding new dive sites and wreck dives. No two are alike and always a new experience even if you dove it before. The visibility is usually sixty to one hundred feet and the water temp is always 78 to 84. Not bad for their first experience.